Very portable table top system. 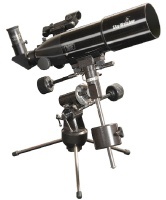 Wide field 80mm refractor on a table top equatorial mount. The ideal "take anywhere" set up.